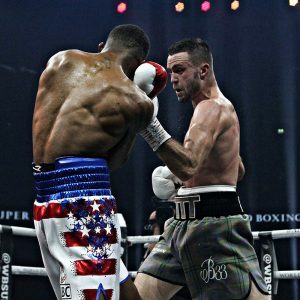 GLASGOW, Scotland – Junior welterweight contender Ryan Martin will have encountered his fair share of bad weather during fight week in Scotland, but the American has now fell victim to a “Tartan Tornado”. Ultra-talented southpaw Josh Taylor handed Martin his first professional defeat by scoring an emphatic seventh-round stoppage at the SSE Hydro on Saturday. The victory sees Taylor advance to the World Boxing Super Series semifinal where he will face new IBF titleholder Ivan Baranchyk. Taylor, who is rated No. 2 by The Ring, decked Martin with a left-hand counter in Round 7 and the American’s equilibrium completely deserted him. Referee Victor Loughlin, who dispensed with the count, was perhaps guilty of an early stoppage, but the decision was merciful as Martin had soaked up a fierce pounding. It was a cautious opening but Taylor (14-0, 12 knockouts) was the only one throwing punches in Round 1. It was difficult to tell whether Martin was merely having a look, or if the moment had gotten the better of him. Soon enough, we had the answer. Martin had his gloves glued to his head early and Taylor smartly touched the guard and then whipped his shots to the mid-section. As early as Round 2, Martin looked completely out of his depth and the Scotsman began adding layers to his offense. Uppercuts pierced the guard and the body shots were delivered with more venom. That pattern continued throughout the early going and in truth the bout was a mismatch before the midway point. What was supposed to a competitive fight had become an opportunity to marvel at Taylor’s ring craft and versatility. The feints and foot movement continually forced Martin to flounder and he was picked off with world-class combination work. Perhaps frustrated at Martin’s lack of engagement, Taylor went inside to do damage in the sixth. He really didn’t have to risk his chin, but at least it was something new. The Scotsman won everything, scoring with more crushing body shots and Martin, now cut around his left eye, looked dejected. A stoppage looked likely and the home fighter delivered it. Taylor continues to go from strength to strength. Last time out the former amateur star floored and outpointed former WBC junior welterweight titleholder Viktor Postol. That bout marked the first time that Taylor was taken the full 12-round distance and he was given ample opportunity to display his fighting guts and ability to adjust. The Scotsman was way too good for Martin who, at 25 years old, has plenty of time to improve under the guidance of acclaimed coach Abel Sanchez.